Neranza Noel Blount paints with encaustic (beeswax & resin) using dental tools, natural hair brushes, a heat gun and a torch to manipulate the molten wax mixture onto surfaces. She uses beeswax collected from her family’s hives to make her own medium and will also include her photography and found objects into her work. 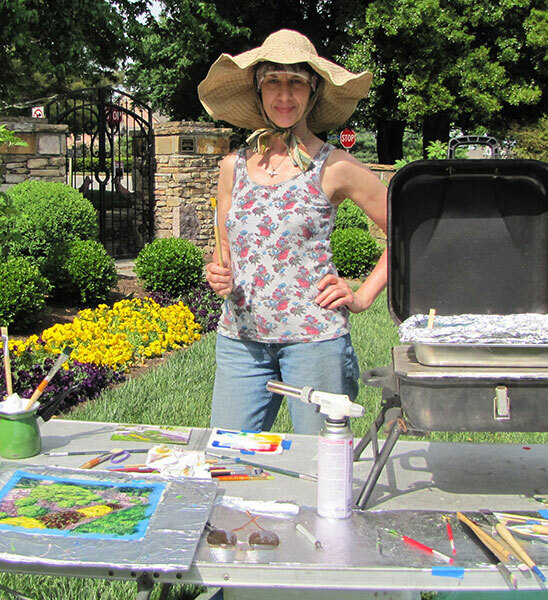 She received her Bachelor of Fine Arts degree with honors from the University of Tennessee with a concentration in drawing and has received top awards for her works of art nationally and internationally. Encaustic is a durable process widely used in ancient times. It preserves colors, and will not melt until the temperature reaches 150 degrees. It can be buffed to shine and eventually will cure keeping the shine. Including environmental and social concerns, with her art she wants to build awareness of the importance of honey bees to mankind, their current plight and what can be done to help them. 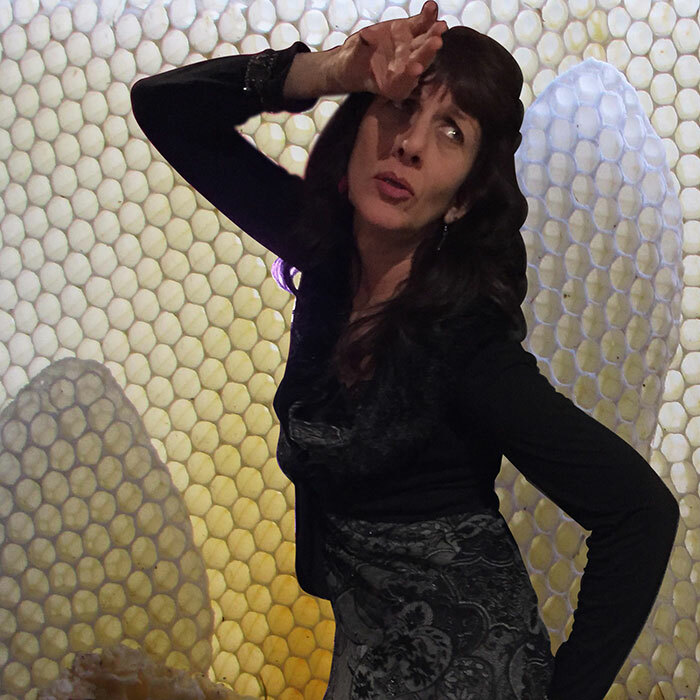 Photo shows her dramatically mourning the possible loss of honey bees. Neranza currently resides in Knoxville, Tennessee living with her husband, an apiary inspector, and about 20 beehives. In 2018 she published a book about her art titled, An Artist’s Journey from Oil to Encaustic, A Decade of Waxing Poetic. 2016 A1LabArts Fall Member Show - Diptych Project - Curated entire project randomly pairing two artist with each other to exchange works of art and then create a companion piece to form a diptych. Also participated in the exchange with one other artist. 2015 A1LabArts Fall Member Show - Chakra Window Project - Curated entire project and facilitated seven groups of artists while collaborating with one of the groups. 2011 Waxing Poetic Justice - Rose Center - Morristown, TN - In conjunction with beekeeping exhibit in adjacent gallery with poetry reading. 2017 Metropolitan Knoxville Airport Authority and Arts & Culture Alliance "Arts in the Airport" - Juried Group Show – Oct – April 2018. 2017 Metropolitan Knoxville Airport Authority and Arts & Culture Alliance "Arts in the Airport" - Juried Group Show - April-Sept.
2013 Metropolitan Knoxville Airport Authority and Arts & Culture Alliance "Arts in the Airport" - Juried Group Show - June-Oct.
1998 Video Maker Magazine - Third Place for comedy commercial produced for pet dental hygiene. 1994 "Take a Hike" - Produced assorted hiking documentaries of the Great Smoky Mountains for Community Television. Videographed, narrated, and edited. I was first introduced to Neranza during a weeklong encaustic workshop I was teaching at Arrowmont Center for the Arts in Tennessee. In that short period of time I saw her intently examine the practice of painting in hot wax and pigment, explore the possibilities of her creative ideas and develop new approaches to her painting. Her enthusiasm and serious interest was infectious. From painstaking studies of master copy to free spirited invention, Neranza's practice of controlling the paint medium while visually giving shape to her ideas is paramount. Coming from a background that includes beekeeping, painting with melted wax seems like a natural calling. The careful observation of nature, her love of the body in motion and a responsive sense of color all contribute to her latest groups of paintings. Whether she is expressing the world through representation or abstraction Neranza’s painting comes from the heart, filtered through the senses and visualized for all to experience. Painter Jasper Johns once suggested that it is commonplace for artists to incorporate or manipulate an object in their work, but when they then repeatedly "do something else to it" the result might be a unique work of art. Local artist Neranza Noel Blount takes those additional steps in her encaustic (ie. wax) paintings. Blount takes photographs of the natural world, applies them to board, and then heaps layer upon layer of pigmented encaustic medium over the photographs. Typically the underlying image is completely concealed by the multiple strata of wax. 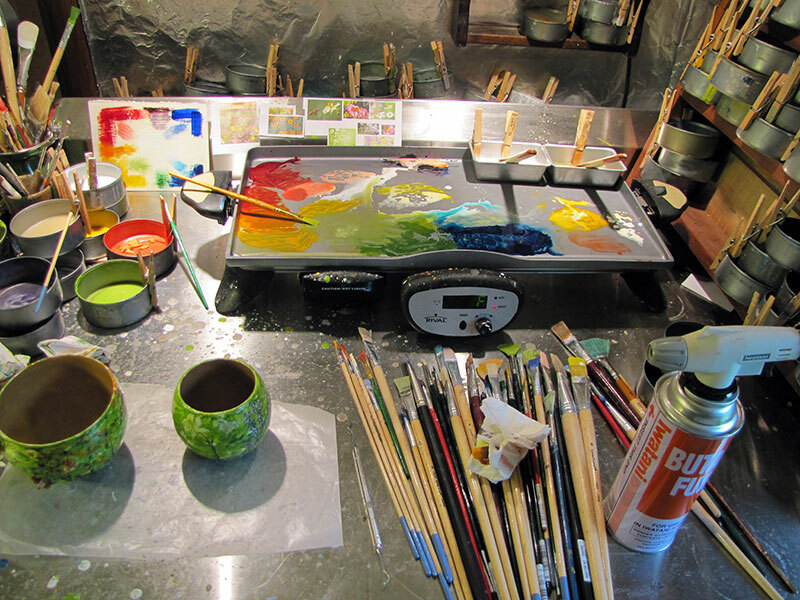 In an interview Blount said she takes particular pleasure in buffing smooth surfaces to bring out the soft shine one can achieve with encaustic. She sometimes adds random scatterings of plant material that render a surface rough in places -- these surfaces tend to be less seductive. Blount also applies multiple layers of thin tissue paper with the wax pigment, and she allows the paper to bubble and crease. After that, by carefully breaking the bubbles to create erratic ridges and indentations, and emphasizing creases with added pigment to create what appear to be natural forms such as waves and tendrils, Blount ends up with surfaces that are complex and painterly, apparently conjured into being. Her best works in this show are the nearly monochromatic waterscapes like "Frozen Creek" that may be the most heavily re-worked yet visually the most stark. Environmental concerns also inform Blount's practice. She wrote: "Little honey bees produce the wax as well as honey which is the only food that will not spoil. Honey bees are so important to our quality of life being our number one pollinator, that so many people do not realize. Besides having fun painting with the wax, I want to help educate the public about honey bees and maybe even encourage new beekeepers." All locations Knoxville, Tennessee unless otherwise indicated.